Successfully Added Digital Voice and Telephone Recorder (Journalist Edition) to your Shopping Cart. This digital voice and telephone recorder comes with 4 GB built-in storage and also works as a regular USB drive to store personal files as well as MP3 music files. If you love gadgets then you're going to love this amazing digital audio recorder. 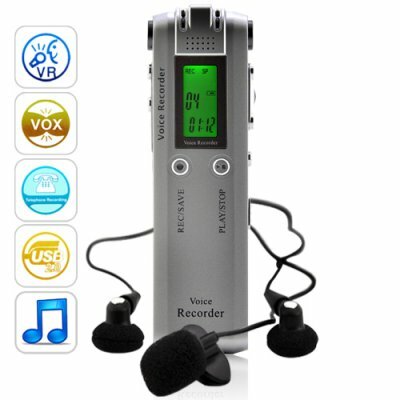 Stylish and compact, this Digital Voice and Telephone Recorder offers one touch recording when you want it, and different quality recording modes when you need it. It's telephone recording function also allows it to be a secret voice recorder, after all, people on the other line don't know they are being recorded. This multipurpose digital audio recorder can be used in lecture theaters, class rooms, presentations, telephone conversation recording, in meetings at the work place etc. It's Powered by a single AAA battery and come with two MIC's for a much clearer audio capture. Selling for so much less than comparable voice recorders, this USB digital voice and telephone recorder is a mean entertainment unit too! It plays MP3s! With 4 GB internal memory, you can load in roughly 400 songs for hours and hours of listening pleasure. Click "Add to Cart" right away to buy one for your home, office, or car and then stock your online store with this incredible all in one gadget - from the online leader in direct from China wholesale electronics - Chinavasion. The recording format depends on the recording mode: If LP is selected as the recording mode then the recording format will be ACT, if SP is selected then WAV will be the recording mode, if HP is selected then MP3 will be the recording mode.